In her 35 year banking career, Theresa Foo made history twice. In 1977 she was the first woman in the Bank of America’s Singapore operations to be made a vice president. Then in 1994 she scored another first when she became Standard Chartered Bank’s first Asian female chief executive. Theresa joined Bank of America (BOA) after graduating from the Australian National University with a Bachelor of Arts degree. She worked her way through the ranks and in 1977, became the first woman in BOA’s Singapore office to be made a vice-president. In 1984 she left BOA to head the corporate and investment banking division of OCBC Bank. Within a year of her joining OCBC, she was promoted to deputy general manager and appointed deputy head of the bank’s newly formed Corporate Banking division. Ten months later, she took over the helm of Corporate Banking and became one of the bank’s four general managers. Theresa left OCBC Bank in 1987 to join Standard Chartered Bank as head of corporate banking. In 1994, she was made the first female Chief Executive of the bank’s Singapore operations. She left Standard Chartered in 2001 and was chairman of BNP Paribas Capital and BNP Paribas Securities until 2009. Theresa is an ardent supporter of the arts. Concurrent to her banking career, Theresa deepened her involvement with the arts. In 1987, she joined the Singapore Symphony Orchestra (SSO) Ladies’ League, a group of female music lovers who raised funds for the SSO, serving as its vice chairlady. In 1997, Theresa joined the board of The Esplanade Co Ltd where she helped with the building of the new national arts venue. She was its chairman from 2005 to 2014. Her dedication to promoting the arts in Singapore was recognised when she was named Champion of the Arts in 2001. She chairs a number of boards, including Gardens by the Bay and the SBF Foundation, which aims to help develop a compassionate and proactive business community. At the Foundation’s launch in late 2013, Theresa said it would focus on encouraging corporate social responsibility, improve the welfare of less-privileged youth and promote their education and employability. Theresa received the Public Service Star at the National Day Awards in 2008. 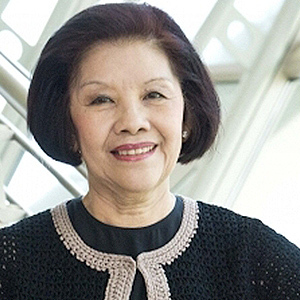 In 2014, she received the Friends of MCCY award from the Ministry of Culture, Community and Youth, and the Meritorious Service Medal for her contributions to the arts.